Play your cards but don’t try too hard. Rajkumar Hirani tries too hard to recreate the Munnabhai magic with 3 Idiots. And although he does not fail miserably, he does not completely succeed either. The Munnabhai flicks had it all. Loads of humour, a warm approach to socially relevant issues and a social message that strives to change the attitude of people around us. Similarly, 3 Idiots takes a dig at the current grades-driven educational system that “manufactures” well-trained people rather than nurturing well-educated individuals. All this, in a light-hearted tone with loads of witticism, sarcasm, movie masala and a message to ‘chase excellence and success will follow‘. Yet, unlike Munnabhai it loses focus and the message somehow gets diluted in the prevailing brouhaha. There are times when you feel that 3 Idiots is overtly preachy, and then there are times when the humour overrides the message thus defeating the entire purpose of the message. And in-spite of this communication failure between the message and the masses, 3 Idiots is nevertheless a rib-tickling witty movie that’ll make you laugh when you least expect it to. Set in an engineering college, 3 Idiots starts off well as the story of Rancho (Aamir Khan), an individualistic free-thinker who breaks through the shackles of the conventional educational system, which focuses more on cramming and less on acquiring knowledge. In this process, he befriends Farhan and Raju (played by Madhavan and Sharman Joshi respectively) showing them the path to their real interest and careers. Rancho also proves a point to the Director of the college (Boman Irani) about the flaws of current educational practices. One fine day, Rancho disappears after doing his good deeds, leaving behind his 2 friends and a heart-broken girl friend (Kareena Kapoor). What happens to Rancho? Where is he? This forms the crux for the remaining part of the movie. 3 Idiots does try to pinpoint the flaws in our educational system and the mad race for false ‘success’ that we are all rushing towards. It also gets serious at a few places showcasing student suicides and the need for better educational practices. However, like described earlier, the triviality of the humour overshadow the real issues. 3 Idiots could have been so much more. Still, watch it for Aamir’s performance, some catchy tunes and one-liners like ‘Aall izz well‘ to relive the fun-n-frolic of your college days. 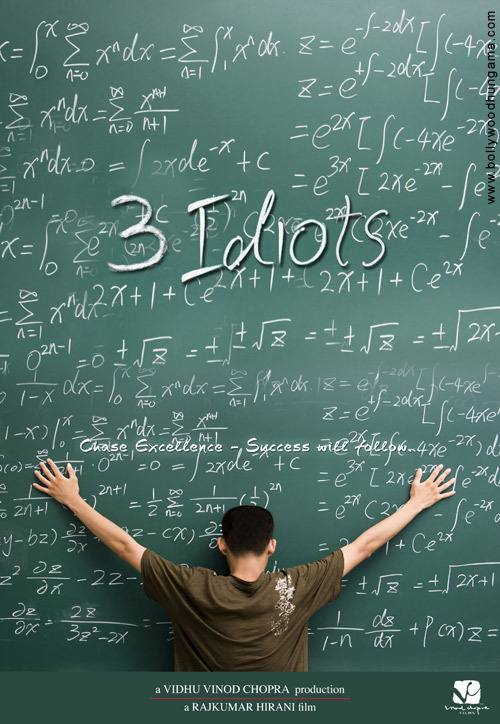 Tags: 3 Idiots, Aamir Khan, education, Munnabhai, Rajkumar Hirani, Review. Bookmark the permalink.